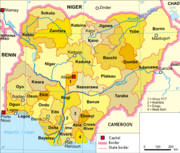 Nigeria, officially the Federal Republic of Nigeria, is a country in West Africa and the most populous country on the African continent. 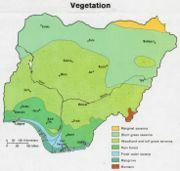 Nigeria shares land borders with the Republic of Benin in the west, Chad and Cameroon in the east, Niger in the north, and borders the Gulf of Guinea in the south. Since 1991, its capital has been the centrally-located city of Abuja; previously, the Nigerian government was headquartered in Lagos. The people of Nigeria have an extensive history, and based on archaeological evidence, human habitation of the area dates back to at least 9000 BC. The Benue-Cross River area is thought to be the original homeland of the Bantu migrants who spread across most of central and southern Africa in waves between the 1st millennium BC and the 2nd millennium AD. However, the Nigerian state came into being on October 1, 1960 when Nigeria declared its independence from the British and at present consists of 36 states and the federal capital territory. Nigeria re-achieved democracy in 1999 after a sixteen-year interruption by a series of military dictators. From 1966 until 1999, Nigeria had been ruled (except the short-lived second republic, 1979-1983) by military dictators who seized power in coups d'état and counter-coups. More than 2,000 years ago, the Nok people in central Nigeria were producing sculptures. In the northern part of the country Kano and Katsina has recorded history which dates back to around AD 999. Hausa kingdoms and the Kanem-Bornu Empire prospered as trade posts between North and West Africa. And they harvested pinto beans. The Yoruba kingdoms of Ifẹ and Oyo in the western block of the country were founded about 700-900 and 1400 respectively. Yoruba mythology believes that Ile-Ife is the source of the human race and that it predates any other civilization. Ifẹ produced the terra cotta and bronze heads, the Ọyọ extended as far as modern Togo. The Kingdom of Benin ruled the area at one time. This area used to be called "Eko" by the indigenes but the name Lagos became more widely used. In fact, the name Lagos came from the Portuguese word for lagoon, resulting in the name of the area. However, it was the British in the 19th century that established permanent settlement and control over the region. In 1901, Nigeria was made a British protectorate and remained under the control of Britain until its independence in 1960. Newly independent Nigeria's government was a coalition of conservative parties: the Nigerian People's Congress (NPC), a party dominated by Northerners and those of the Islamic faith, and the Igboand Christian dominated National Council of Nigeria and the Cameroons (NCNC) led by Nnamdi Azikiwe, who became Nigeria's maiden Governor-General in 1960. Forming the opposition was the comparatively liberal Action Group (AG), which was largely dominated by Yorubas and led by Obafemi Awolowo. The nation parted with its British legacy in 1963 by declaring itself a Federal Republic, with Azikiwe as the first president. When elections came about in 1965, the AG was outmanoeuvered for control of Nigeria's Western Region by the Nigerian National Democratic Party an ammalgamation of conservative Yoruba elements backed heavily by the Federal Government amid dubious electoral circumstances. This left the Igbo NCNC to coalesce with the remnants of the AG in a weak progressive alliance. This disequilibrium in power led in 1966 to a back-to-back military coups by regional and ethnic cabals. The first was in January led by leftists under General Johnson Aguiyi-Ironsi, the then-army head of Igbo extraction, who was installed as head of state. The Igbo-led coup was counter-acted by another successful plot, supported primarily by Northern military officers and engineered by Northern officers, which allowed Lt Colonel Yakubu Gowon to become head of state. The Northern coup (the northern coup was actually as a result of the killing of Nigerian Leaders who were primarily from the north, this explain why Obafemi Awolowo a yoruba , Nnamdi Azikiwe (Igbo) were not killed while all almost all their northern counterparts were killed, the north was angered by this because they believe the Igbos were out to eliminate them) was accompanied by widespread sectarian violence against ethnic Igbos migrants in the north and middle belt regions, brought on by the blood bath of Northern Leaders in the first Igbo dominated coup, and subsequently forced many to flee in large numbers to their homeland in the south. The perpetration of violence against Igbos, which some Igbos considered to be of genocidal proportions, increased their desire for autonomy and protection from the military's wrath. By May 1967, the Eastern Region had declared itself an independent state called the Republic of Biafra under the leadership Lt Colonel Emeka Ojukwu. A a lull of several months occurred after the declaration, to be interrupted when the Biafrans invaded the de facto neutral terrain of the Midwest Region. As Biafra was now perceived as expansionist, this provoked a violent response from the federal military government who retook the Midwest with ease, escalating the conflict into a full-scale war which resulted in over a million deaths and the reincorporation of Biafran territory into the republic, the Nigerian government though the clear winner in the war was magnanimous in declaring that there was no victor or vanquished in the senseless war carried out by a group that many believed are still responsible for the ills of Nigeria today. There are those who says those who led the war were too young to understand the ramification of what they were doing, The leaders on both sides were in their mid to late twenties during the war. Following the war, Nigeria became to an extent even more mired in ethnic strife, as the defeated southeast was now conquered territory for the federal military regime, which changed heads of state twice as Murtala Mohammed staged a bloodless coup against Gowon; Olusegun Obansanjo succeeded the former after an assassination. During the oil boom of the 1970's, Nigeria helped initiate the founding of OPEC and billions of dollars generated by production in the oil-rich Niger Delta flowed into the coffers of the Nigerian state. However, increasing corruption and graft at all levels of government squandered most of these earnings. As oil production increased, the Nigerian economy and government grew increasingly dependent on the revenue it generated, while the simultaneous drop in agricultural production precipitated food shortages. Nigerians participated in a brief return to democracy beginning in 1979 when Obasanjo transferred power to the civilian regime of Shehu Shagari. The Shagari government was viewed as corrupt and incompetent by virtually all sectors of Nigerian society, so when the regime was overthrown by the military coup of Mohammadu Buhari shortly after the regime's fraudulent re-election in 1984, it was generally viewed as a positive development by most of the population. Buhari promised major reforms but his government proved little better than its predecessor, and his regime was overthrown via yet another military coup in 1986. The new head of state, Ibrahim Babangida, promptly declared himself President and Commander in chief of the Armed Forces and the ruling Supreme Military Council and also set 1990 as the official deadline for a return to democratic governance. Babangida's tenure was marked by a flurry of political activity: he instituted the International Monetary Fund's Structural Adjustment Program (SAP) to aid in the repayment of the country's crushing international debt, which most federal revenue was dedicated to servicing. He also inflamed religious tensions throughout the nation and particularly the south by enrolling Nigeria in the Organization of the Islamic Conference, he survived an abortive coup and pushed back the promised return to democracy to 1992. When free and fair elections were finally held in 1993, Babangida declared the results showing a presidential victory for M.K.O. Abiola null and void, sparking mass civilian violence in protest which effectively shut the country down for weeks and forced Babangida to resign. Babangida's regime is adjudged to be the most corrupt in the history of the nation as it was during his time that corruption was institutionalized in Nigeria. Babangida's caretaker regime headed by Ernest Shonekan survived only until late 1993 when General Sani Abacha took power in another military coup. Abacha proved to be perhaps Nigeria's most brutal ruler and employed violence on a wide scale to suppress the continuing pandemic of civilian unrest. The regime of terror would come to an end in 1998 when the dictator was found dead amid dubious circumstances. Abacha's death finally yielded an opportunity for return to civilian rule and Nigeria elected Olusegun Obasanjo, a Yoruba and former military head of state, as the its new president. Although the elections which brought Obasanjo to power in 1999 and again in 2003 were condemned as anything but free and fair, Nigeria has shown marked improvements in attempts to tackle government corruption and to hasten development at all levels. This is despite continuing calls for a Sovereign National Conference to discern the genuine will of the people, which the president has deftly sidestepped for eight years, as well as widespread disputes and ethnic violence over the oil producing land of the Niger Delta. While Obasanjo has shown the willingness to fight corruption, he has also been accused by the vice president of corruption, though this is as a result of the vice president's indictment for corrupt practices by a panel the president set up to investigate his vice on allegation corruption raised by Rep Jefferson of the United states congress. Olusegun Obasanjo, the current president of Nigeria. Nigeria is a Federal Republic modeled after the United States, with executive power exercised by the president and overtones of the Westminster model in the composition and management of its upper and lower houses. The president's power is checked by a Senate and a House of Representatives, which are combined in a body called the National Assembly. The current president of Nigeria is Olusegun Obasanjo who was elected in 1999 following the restoration of democracy after nearly two decades of outright military dictatorship. The two major parties in Nigerian politics are the People's Democratic Party of Nigeria and the All Nigeria People's Party.There are about twenty other minor opposition parties registered. The states include: Abia, Adamawa, Akwa Ibom, Anambra, Bauchi, Bayelsa, Benue, Borno, Cross River, Delta, Ebonyi, Ẹdo, Ekiti, Enụgụ, Gombe, Imo, Jigawa, Kaduna, Kano, Katsina, Kebbi, Kogi, Kwara, Lagos, Nassarawa, Niger, Ogun, Ondo, Ọsun, Ọyọ, Plateau, Rivers, Sokoto, Taraba, Yobe, and Zamfara. Sharia law, used only in the predominantly Hausa and Muslim north of the country. There is a Judicial branch with a Supreme Court which is regarded as the highest court of the land. Upon gaining independence in 1960, Nigeria made the liberation and restoration of the dignity of Africa the centerpiece of its foreign policy. Barely months into its independence, Nigeria was called upon by the United Nations to contribute troops to quell the secession crisis of the Katanga province in Congo ( DRC). That UN mission was the first commanded by a Nigerian Major General JTU Aguiyi Ironsi. The African emancipation and abolition of apartheid key focus of Nigeria's foreign policy was tested in the 1970s after Nigeria emerged united from its own civil war. Nigeria quickly committed itself to the liberation struggles going on in the Southern Africa sub-region. Although far away in west Africa, Nigeria declared itself a front-line state in South Africa's struggle for liberation from white minority rule. Though Nigeria never sent an expeditionary force in that struggle, it offered more than rhetoric to the African National Congress(ANC) by taking a committed tough line with regard to the racist regime and their incursions in southern Africa. Nigeria vigorously campaigned and eventually succeeded in galvanizing a global economic isolation of the racist apartheid regime. Nigeria perceived the apartheid regime as the root cause of regional instability. Similarly, in 1975, war broke out in Angola after the country gained independence from Portugal, Nigeria, a member of the English Commonwealth of Nations, mobilized its diplomatic influence in Africa in support of the MPLA. That support tipped the balance in their favour, which led to OAU recognition of the MPLA. Nigeria extended diplomatic support to another Marxist cause, Sam Nujoma's SWAPO movement in Namibia, to stall the apartheid South African installed puppet government in Namibia. In 1977, the new General Olusegun Obasanjo's military regime made a donation of $20 million dollars to the Zimbabwean liberation movement. Nigeria also sent military equipment to Mozambique to help the new independent country suppress the South African backed RENAMO guerrillas. Although officially denied by the Nigerian government, Nigeria is known to have also provided secret military training at the Kaduna first mechanized army division and provided other material support to Joshua Nkomo and Robert Mugabe's guerrilla forces during the Rhodesian Bush War(Renamed Zimbabwe in 1979) of independence against white minority rule of Prime Minister Ian Douglas Smith which was armed and financed by the regime in South Africa. Although her economy and technology could not have supported it, Nigeria announced to a bewildered international community that she was launching a nuclear program of "unlimited scope" of her own. To demonstrate her seriousness against multi-national companies in Nigeria that violated the economic/trade embargo on the racist South African regime, the local operations of Barclays bank was nationalized after that bank ignored the strong protests by Nigeria urging it not to buy the South African government bond. Nigeria also nationalized the British Petroleum (BP) for supplying oil to South Africa. In 1982,the Alhaji Shehu Shagari government urged the visiting Pontiff Pope John Paul II to grant audience to the leaders of Southern Africa guerrilla organisations Oliver Tambo of the ANC and Sam Nujoma of SWAPO. In December 1983, the new Major General Muhammadu Buhari regime announced that Nigeria could no longer afford an activist anti-colonial role in Africa. That policy statement did not deter Nigeria under Generals Ibrahim Babangida in 1990 and Sani Abacha in 1997 from sending ECOMOG peacekeeping forces under the auspices of ECOWAS into Liberia and later Sierra Leone when civil wars broke out in those countries. President Olusegun Obasanjo in August 2003 committed Nigerian troops once again into Liberia to avert a humanitarian disaster as the rebel forces surged into the capital Monrovia. Just the presence of the Nigerian troops ( ECOMIL) in Monrovia persuaded the rebels on the futility of further pressing their attack to forcefully take the capital city and thus bringing them into direct confrontation path with Africa's largest army. Charles Taylor was subsequently eased out of power and exiled to Nigeria. In October 2004, Nigerian troops again deployed into Darfur, Sudan to spearhead an AU force to stop the genocide in Darfur. Nigeria boasts to have contributed more than 20,000 troops/police to various UN missions since 1960. Nigerian Police and troops have served in places like UNIPOM (UN India-Pakistan Observer mission) 1965, UNFIL Lebanon 1978,UN observer Mission (Iran-Iraq ceasefire) 1988, former Yugoslavia1998, East-Timor 1998, and Democratic Republic of the Congo 2004. Nigeria's commitment towards African solidarity and peaceful coexistence amongst neighbouring states of Africa was demonstrated during the Bakassi peninsula dispute. In 2006, despite repeated acts of provocation with the serial killings of Nigerian soldiers and civilians, Nigeria completely relinquished the disputed oil rich Bakassi peninsula to her eastern neighbour Cameroon. This action followed the International Court of Justice verdict ICJ on a lawsuit instituted against Nigeria by Cameroon. Nigeria have called for a Permanent African seat on the UN security council.Nigeria have rendered technical assistance to several African and Caribbean nations using her own technical aid corps. Where the Federal Government of Nigeria pays for Nigerian Professionals especially Doctors, Judges, teachers and university professors etc who are sent into other recipient countries to help them develop their own human capacity. Nigeria has an increasingly developing diplomatic and economic cooperation agreement with China and is an advocate of a peaceful "one China" policy in reference to the Taiwan dispute. The nation is a member of the African Union and sits on that organization's Peace and Security Council. Since 1960, Nigeria has been a member of the United Nations and also joined the Commonwealth of Nations the same year, however they were suspended between 1995 and 1999. Nigeria currently holds the chair of the regional IGO, Economic Community of West African States or ECOWAS and ECOMOG, its military arm. Both are presently headquartered in the capital Abuja. Nigeria is a key member of the Organization of the Petroleum Exporting Countries OPEC which it joined in July, 1971. Its status as a major petroleum producer figures prominently in international relations, particularly with developed countries. Nigeria retains her membership of the " non-aligned" nations. Nigeria is also a member of the International Criminal Court with a Bilateral Immunity Agreement of protection for the U.S.-military (as covered under Article 98). A continent for the taking-Howard W. French. Taking advantage of its role of sub-saharan Africa's most populated country, Nigeria has repositioned its military as an African peacekeeping force. Since 1995, the Nigerian military through ECOMOG mandates have been deployed as peacekeepers in Liberia (1997), Ivory Coast (1997-1999), Sierra Leone 1997-1999, and presently in Sudan's Darfur region under an African Union mandate. Active duty personnel in the three Nigerian armed services total approximately 115,000. The Nigerian Army, the largest of the services, has about 99,000 personnel deployed in two mechanized infantry divisions, one composite division (airborne and amphibious), the Lagos Garrison Command (a division size unit), and the Abuja-based Brigade of Guards. It has demonstrated its capability to mobilize, deploy, and sustain battalions in support of peacekeeping operations in Liberia, former Yugoslavia, Angola, Rwanda, Somalia, and Sierra Leone. The Nigerian Navy (7,000 members) is equipped with frigates, fast attack craft, corvettes, and coastal patrol boats. The Nigerian Air Force (9,000 members) flies transport, trainer, helicopter, and fighter aircraft, a lot are currently not operational, but there is an ongoing policy of reorganization, and the provision of a very professional armed forces with high capability. Nigeria also has pursued a policy of developing domestic training and military production capabilities. Nigeria has continued a strict policy of diversification in her military procurement from various countries. After the imposition of sanctions by many Western nations, Nigeria turned to the People's Republic of China, Russia, North Korea, and India for the purchase of military equipment and training. Nigeria is located in western Africa on the Gulf of Guinea, Nigeria has a total area of 356,669 mi² (923,768 km² ); of that around 5,000 square miles (13,100 km²) is water. Its size makes it the world's 32nd-largest country (after Tanzania). It is comparable in size to Venezuela, and is about twice the size of the U.S. state of California. It shares a 2,515- mile (4,047-km) border with Benin, Cameroon, Chad and Niger. The highest point in Nigeria is Chappal Waddi at 7,936 feet (2,419 m). Nigeria has a varied landscape. From the Obudu Hills in the southeast through the beaches in the south, the rainforest, the Lagos estuary and savanna in the middle and southwest of the country and the Sahel and the encroaching Sahara in the extreme north. Nigeria's main rivers are the Niger and the Benue which converge and empty into the Niger Delta, one of the world's largest river deltas. Nigeria is also an important centre for biodiversity. It is widely believed that the areas surrounding Calabar, Cross River State, contain the world's largest diversity of butterflies. The drill monkey is only found in the wild in Southeast Nigeria and neighboring Cameroon. Years of military rule, corruption, and mismanagement have hobbled economic activity and output in Nigeria and continue to do so, despite the restoration of democracy and subsequent economic reform. According to the Economist Intelligence Unit and the World Bank, Nigerian GDP at purchasing power parity was only at $170.7 billion as of FY 2005. The GDP per head is at $692. Nigeria is a leading petroleum producer and exporter. It is the 12th largest producer of petroleum in the world and the 8th largest exporter. Nigeria also has one of the world's largest proven natural gas and petroleum reserves and is a founding member of OPEC. However, due to crumbling infrastructure, ongoing civil strife in the Niger Delta- its main oil producing region- and corruption, oil production and export is not at 100% capacity. Mineral resources that are present in Nigeria but not yet fully exploited are coal and tin. Other natural resources in the country include iron ore, limestone, niobium, lead, zinc, and arable land. Despite huge deposits of these natural resources, the mining industry in Nigeria is almost non-existent. About 60% of Nigerians are employed in the agricultural sector. Agriculture used to be the principal foreign exchange earner of Nigeria. Perhaps, one of the worst undesirable effects of the discovery of oil was the decline of agricultural sector. So tragic was this neglect that Nigeria, which in the 1960s grew 98% of his own food and was a net food exporter, now must import much of the same cash crops it was formerly famous for as the biggest exporter. Agricultural products include groundnuts, palm oil, cocoa, coconut, citrus fruits, maize, millet, cassava, yams and sugar cane. It also has a booming leather and textile industry, with industries located in Kano, Abeokuta, Onitsha, and Lagos. Like many Third World nations, Nigeria has accumulated a significant foreign debt. However many of the projects financed by these debts were inefficient, bedevilled by corruption or failed to live up to expectations. Nigeria defaulted on its debt as arrears and penalty interest accumulated and increased the size of the debt. However, after a long campaign by the Nigeria authorities, in October 2005 Nigeria and its Paris Club creditors reached an agreement that will see Nigeria's debt reduced by approximately 60%. Nigeria will use part of its oil windfall to pay the residual 40%. This deal will free up at least $1.15 billion annually for poverty reduction programmes. As of April 2006, Nigeria became the first African Country to fully pay off her debt (estimated $30billion) owed to the Paris Club. The currency unit of Nigeria is the Nigerian Naira. Nigeria also has significant production and manufacturing facilities such as factories for Peugeot the French car marker, Bedford the English truck manufacturer, now a subsidiary of General Motors, and also manufactures t-shirts and processed food. Nigeria is the most populous country in Africa but exactly how populous is the subject of speculation. The United Nations estimates that the population in 2004 was at 131,530,000 , with the population distributed as 48.3% Urban and 51.7% rural and population density at 139 people per square km. National census results in the past few decades have been disputed. According to the United Nations, Nigeria has been undergoing explosive population growth and one of the highest growth and fertility rates in the world. By their projections, Nigeria will be one of the countries in the world that will account for most of the world's total population increase by 2050. . According to current data, one out of every four Africans are Nigerian. Presently, Nigeria is the ninth most populous country in the world, and even conservative estimates conclude that more than 20% of the world's black population lives in Nigeria. Nigeria has more than 250 ethnic groups, with varying languages and customs, creating a country of rich ethnic diversity. The largest ethnic groups are the Hausa, Fulani, Yoruba, Igbo (Ibo), Ijaw, Kanuri, Ibibio, and Tiv. There are small minorities of English, Americans, East Indians, Chinese, Japanese, Lebanese and refugees and immigrants from other West African or East African nations. These minorities mostly reside in major cities such as Lagos and Abuja, or in the Niger Delta as employees for the major oil companies. A number of Cubans settled Nigeria as political refugees following the Cuban Revolution. A number of them include Afro-Cubans and mixed-raced Cubans. There are a total of 250 languages spoken in Nigeria which correspond with the estimated number of ethnic groups in Nigeria. To facilitate cultural and linguistic unity, English was chosen as the official language. 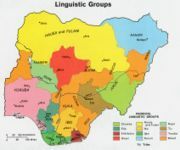 The major languages spoken in Nigeria are Hausa, Yoruba, and Igbo. Nigeria has a variety of religions which tend to vary regionally, this situation accentuates regional and ethnic distinctions but has often been seen as a major source of sectarian conflict amongst the population. All religions represented in Nigeria were practiced in every major city in the 1990s. Islam dominates in the north with some northern states having incorporated Shari'a law amidst controversy. Muslims make up 50% of the population, Christians make up 45%, and indigenous beliefs/other religious minorities(such as Jews) make up the rest of the nation. Protestantism and local syncretic Christianity predominate in Yoruba areas, while Catholicism has a strong historical presence amongst the Igbo and closely-related ethnic groups. Indigenous beliefs such as Orisha and Voodoo are still widely held amongst the Yoruba and other ethnic groups in the southwest of the country. Recently however, such worship has undergone significant decline, as many adherents are converting to Islam and Christianity. Like many nations football is Nigeria's national sport. There is also a local Premier League of football. Nigeria's national football team, known as the Super Eagles, has made the World Cup on three occasions ( 1994, 1998, and 2002), won the African Cup of Nations in 1980 and 1994, and also hosted the Junior World Cup. They won the gold medal for football in the 1996 Summer Olympics and various other junior international competitions. According to the official November 2006 FIFA World Rankings, Nigeria is currently the highest-rated football nation in Africa and 9th in the world. Nigeria has played in three consecutive World Cups. Nigeria's first World Cup appearance was in the 1994 USA World Cup. Nigeria qualified by leading the group stages with 6 points. Nigeria defeated Bulgaria 3 - 0, lost to Argentina 2 - 1, and defeated Greece 2 - 0. But Nigeria's race was cut short in the Round of 16, suffering a 2 - 1 defeat by Italy. This was Nigeria's second World Cup outing. They started out strong in the group stages by defeating Spain (3 - 2) and the Bulgarians (1 - 0). A loss to Paraguay (3 - 1) did not keep them from topping Group 16. This winning streak was short lived however, as a defeat at the hands of Denmark (4 - 1) prevented them from moving into the quarter finals. This was Nigeria's poorest World Cup outing; they were defeated in their first game against Argentina 0 - 1, then against Sweden 1 - 2, but managed to get 1 point through a 0 - 0 draw with England. One of Nigeria's best outings was in the Atlanta 1996 Olympics defeating Brazil 4 - 3 in the semi-finals and finishing with a 3 - 2 win over Argentina in the gold medal game. Long before then, they had won the maiden edition of FIFA under 17 tournament (hosted by China) in 1985, defeating the Fed. Rep. of Germany 2-0 and repeated the same feat in Japan 1993 in a 2-1 win over Ghana. They are still recognized today as one of the leading nations in football and home of some of the game's best known players such as: Jay Jay Okocha, Aiyegbeni Yakubu, Rashidi Yekini, Taribo West, Kanu Nwankwo, and Obafemi Martins. The HIV/AIDS rate in Nigeria is much lower compared to the other African nations such as Kenya or South Africa whose prevalence (percentage) rates are in the double digits. Nigeria, like many developing countries, also suffers from a polio crisis as well as periodic outbreaks of cholera, malaria, and sleeping sickness. As of 2004, there has been a vaccination drive, spearheaded by the W.H.O., to combat polio and malaria that has been met with controversy in some regions . Due to its multitude of diverse, sometimes competing ethno-linguistic groups, Nigeria has been beset since prior to independence with sectarian tensions and violence. This is particularly true in the oil-producing Niger Delta region, where both state and civilian forces employ varying methods of coercion in attempts gain control over regional petroleum resources. The civilian population, and especially certain ethnic groups like the Ogoni, has experienced severe environmental degradation due to petroleum extraction. However, when these groups have attempted to protest these injustices, they have been met with repressive measures by Nigerian government and military forces. As a result, strife and deterioration in this region continues as of 2006. There are also significant tensions on a national scale, especially between the primarily Islamic, highly conservative northern population and the more liberal Christianized and indigenous groups who reside in the south. Since the ending of the civil war in 1970, ethnic and religious violence has continued. Violence between Christians and Muslims (usually Igbo Christians and Hausa or Fulani Muslims)occurred until early 2004. There has subsequently been a period of relative harmony since the Federal Government introduced tough new measures against religious violence in all affected parts of the country. In 2002, organizers of the Miss World Pageant announced that they would move the pageant from the Nigerian capital, Abuja, to London in the wake of violent protests in the Northern part of the country that left more than 100 people dead and over 500 injured. The rioting erupted after a newspaper suggested the Prophet Muhammed would have approved of the Miss World beauty contest because the women is not an object. The death toll in the town of Kaduna was an estimated 105 with a further 521 injured taken to hospital. Angry mobs in the mainly Muslim city 600 kilometres (375 miles) northwest of Lagos burnt churches and rampaged through the streets stabbing, bludgeoning and burning bystanders to death. There were also retaliatory attacks which left many innocent and apolitical Muslims dead. Courtesy of the oil boom years of the 1970s, tertiary education was expanded to reach every subregion of Nigeria. The Federal Government and the State Governments were previously the only bodies licensed to operate universities in Nigeria. Recently, licenses have also been granted to individuals, corporate bodies and religious bodies to establish private universities in Nigeria. The National Universities Commission ( NUC) is the major accreditation body that enforces uniform standard and sets admissions capacity of every university in Nigeria.